Christmas trees stand at the heart of most family Christmas celebrations indoors for just 12 days, decorated with gleaming baubles and shimmering trimmings, the repository of all those dreams and wishes that Santa brings. Some seven million festive trees are bought each year in the UK and make their way into homes, hotels, offices, outdoor squares, and many other public buildings, to join in our Christmas celebrations. My book The Christmas Tree offers a glimpse into the legends and history behind these stately forest trees that just want to party with us at the festive season. Christmas trees are all conifers, a group of plants that have been around a long time. They are among the oldest trees in the world, their fossil record dating back to the Devonian period some 405 million years ago. Perhaps they pulled rank on the later, relative newcomers, to get ahead in the party stakes and become one of the potent symbols of Christmas. The cover of my book, The Christmas Tree. Details below. The Christmas tree, whether large or small, is the symbol of the power our ancestors attributed to evergreen plants, as survivors of winter. The story starts aeons ago when evergreen plants such as holly, ivy, box, bay, laurels and conifers, able to hold their shiny leaves or aromatic needles through the long winter months, were a source of wonder to our pre-Christian ancestors. In many myths and legends power is centred on a sacred tree. These bold and brave evergreens, surviving the rude blasts of winter, came to signify good fortune, rich harvests, good health and fruitful marriage. In pre-Christian celebrations of the December feast of Saturn, the god of agriculture, homes and hearths were decorated with branches of these powerful evergreens. The elders of the early Christian church realised that some of the elements of these seasonal festivals could be adapted and crafted to fit their own, so it was easy for these evergreen plants to win a decorative place, despite losing their mythic power, at our Christmas festivities. Records from 15th-century Italy and Germany note the use of flowers, as well as branches and garlands of fir and other evergreens in houses, while biblical dramas or mystery plays celebrated a sacred or paradise tree, often a fir tree hung with apples and surrounded by candles. Tree decorating brings to mind all the times down the years that I have brought out treasured ornaments, old and new to find their places on the tree. One of these paradise trees on display in a pageant at the court of Henry VIII in 1516, described as being hung with ‘roses and pomegranates’, sounds as stylish as any of today’s ‘best-dressed’ trees. Sixteenth-century tradition links Martin Luther, the German leader of the Reformation, to the origins of our modern-day Christmas tree. 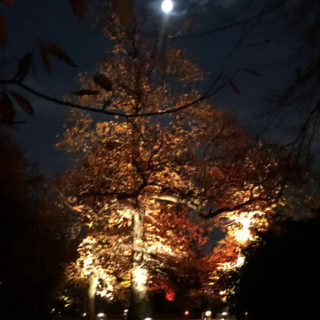 The story tells how, after returning home on a clear and star-lit night, Luther set up a tree for his family, lighting it with candles to recreate his walk under a starry sky. For a short period in the mid-17th century (1647–1600) during Cromwell’s era, all vestiges of Christmas celebrations including garlands, greenery and decoration of any sort were banned. But soon after the monarchy was reinstated Christmas revelry returned. The first importers of the Germanic traditions based on the Christmas tree were German merchants, German members of the aristocracy and new members of the Royal family. The first person, known to have used a decorated Christmas tree to entertain her own children, was Princess Charlotte of Mecklenbuurg-Strelitz, who married King George III in 1761. Her niece, Princess Victoria, wrote in her journal of 1833 of ‘two large round tables on which were placed trees hung with lights and sugar ornaments’. The tree was by now well-established in court circles and its wider popularisation is attributed to Victoria’s husband, Prince Albert. By the 1890s, Christmas tree markets were a key seasonal feature at London’s Covent Garden. One retailer’s records showed that he could supply trees up to 13 metres in height and that his sales topped 30,000 trees annually. Blackthorpe Barn, near Bury St Edmunds in Suffolk, is renowned for its Christmas trees, on sale for a few more weeks during December. A row of small specimens of Nordman firs ready for sale at Blackthorpe Barn. In North America the tree made swift progress into the hearts and onto the hearths of the nation, following its arrival during the mid-18th century in the customs of Hessian mercenaries who came to fight in the War of Independence. In the early 19th century, Mathew Zahm, a settler in Pennsylvania, provides the first written record of the later familiar custom of a family going out to cut down a fir tree. These first trees came from natural forests or lumber yards, but in 1851 the first commercial sale of trees took place in New York City, when Mark Carr, a farmer from the Catskills brought two sleds laden with trees into the city. The result was a quick sell out. Some 30 years later there were 600 dealers selling trees imported from all parts of America. At the turn of the 20th century the first commercial plantation of Norway spruce, specifically for the Christmas market, was established in New Jersey. It would be just a few years before customers could select and carry home the tree of their choice, to support traditional or modern decorations, keeping alive a seemingly timeless custom. Whether its origins are in the tree worship of pre-Christians or in later Church customs, the Christmas tree’s place as a universal secular symbol of a winter festival is assured. Christmas tree growers up and down the country – there are around 600 growers with 28,000 acres of spruce, fir and pine grown specifically for the Christmas market – will be pleased when the first frosts arrive. For it is at this point that the trees in this niche market go dormant, and a chemical reaction takes place in the tree that helps to fix the needles, preventing the dreaded ‘needle drop’ on the carpet. In modern Europe the tradition of outdoor trees, public and private, is well-established. Public trees have been popular on both sides of the Atlantic since the end of the 19th century and most large public trees in city centres and outside public buildings are ‘gift’ or sponsored trees. The lights on the tree on the Market Hill in Sudbury were switched on in late November. Best known of these in the United Kingdom is the tree that stands sentinel in Trafalgar Square. Ever since 1947 the Christmas tree in Trafalgar Square has been the traditional gift from to the people of London from the people of Norway. It is officially given by Oslo, Norway’s capital city, in thanks for support Norway received from Britain during the Second World War. As you would expect the tree is usually a Norway spruce. Felled in November, it is likely to be around 60 years old and about 25 metres in height. It makes its journey to London by sea and road and is hoist in place by a specialist rigging team using an hydraulic crane. Finally it is adorned with vertical strings of white lights, adding up to an estimated 500 energy-efficient bulbs, which this year will be switched on at a lighting ceremony on 6 December at 6pm. On Twelfth Night (6 January) the tree comes down, ready to be chipped and composted into mulch. For 20 years, a member of the British Christmas Tree Growers Association (BCTGA) has been awarded the most important honour of the year: to provide a tree to stand proud outside Number 10 Downing Street. This year that privilege goes to John Junor of Farr North Christmas Trees in Inverness. He received the most votes from his fellow growers to become ‘Grower of the Year’ who provides trees that we are likely to see on our TV screens throughout the festive season when politics gets in the way of the festivities. The title of runner-up ‘Grower of the Year’ went to Cornwall-based James Adams of Ladydowns Christmas Trees, who will provide the tree for one of the interior displays at Number 10. The winner of ‘Champion Festive Wreath’ was Hans Alexandersen of HA Trim near Guildford who will provide the wreath to decorate the famous front door. I found a few cheering wreaths for front doors and interiors in my pre-Christmas trawls around the countryside. How about a feathered wreath, or an artificial Brussels sprout ring, or a traditional holly and ivy ring? A feather wreath or a sprout wreath for your front door? I would love to have the interior space for a really large traditional tree, like this huge specimen that I saw at the Royal Botanic Gardens Kew, when I went on the Christmas at Kew trail. London hotels such as The Savoy and Claridges offer their own take on the public tree, cool and elegant by day, but glamorously lit at night. There is an exciting range of trees available with a range of different needle density, shape and colours. Nordman fir is likely to be the top seller, followed by the old faithful Norway spruce and then Fraser fir. Smaller, contained trees are the best choice for the indoor tree. What’s more a potted tree – some will be specially grown in containers, while others will be dug up and containerised – will survive indoors and can be planted outside once Twelfth Night is passed. Nordman firs have good needle-holding qualities, with strong and straight branches. Its flat needles have silvery undersides. Fraser firs have a good shape and hold their needles well. Silver-blue is the ‘new green’ in the festive tree world. Noble fir, with its even layers of branches that offer the home tree decorator extra scope, has dark blue-green needles, which twist upwards – and it holds them well. Also in demand is the white or concolor fir with soft, silvery blue colour. It also has good needle-holding qualities and its shape makes it easy to load with tree trimmings. Lodgepole and Scots pine are also worth considering especially for their sharp pine-scented needles and good shape. The most popular and traditional tree is the Norway spruce. It is the least expensive as it is widely available, but its main disadvantage is its poor needle-holding ability once in our super-heated homes. Whether I have a traditional tree or use branches from the garden to fashion an indoor twiggery, I usually purchase a few more ornaments. I try to buy those that have a garden or tree theme. This year I bought a bright and jolly Christmas tree to hand on the twig ‘tree’ and also some figs and pomegranates to make it sparkle. A bright and jolly Christmas tree for the twig tree, plus one or two figs and pomegranates, harking back to those burnished apples of Henry VIII’s festive pageants. Or maybe some Brussels sprouts…. Barbara Segall is the author of The Christmas Tree (Ebury Press). Copies of the book are available from me via this website at £9.99 plus p&p (£1.50), or from the shop at Gainsborough’s House in Sudbury, Suffolk; Blackthorpe Barn in Bury St Edmunds, Suffolk; and Harris and Harris Bookshop in Clare, Suffolk. I loved this post– a little bit of history, past and modern, beautiful photos and a lot of Christmas spirit. Hi Angie, thank you for your comment about the blog and my Christmas tree facts and fancies. Glad you enjoyed it. Wish you well fir the festive season… ha what an apt typo that was…. should be ‘for’ the festive season!